Also known as "Terre de nos aïeux"
"Life for Alexis Tremblay and his family is dedicated to the soil, following the tradition of ancestors who settled in Québec along the shores of the St. Lawrence over three hundred years ago. In this existence the church plays an important part, the blessing of the seed each spring being a sacred ritual passed on from one generation to another. We follow this French Canadian family through the busy autumn days as they bring in the harvest and help with bread baking and soap making. Winter sees the children revelling in outdoor sports while the women are busy with their weaving, and, with the coming of spring young and old alike repair to the fields once more to plough the earth in preparation for another season of varied crops." "For years (until it was withdrawn from circulation in 1960), [Alexis Tremblay: Habitant] was one of the NFB's most popular films. If one can now easily condemn its ideologically reassuring image of happy peasants secure in the bosom of their faith, it is also necessary to consider its context. It reflects precisely an image propounded at the time by Quebec society itself, most significantly by the Church. But beyond this, it is a striking example of a continuing current in Canadian documentary: the romantic idyll of life on the land, where the innocence and peace of childhood remain undisturbed as humanity lives in harmonious relation with nature." 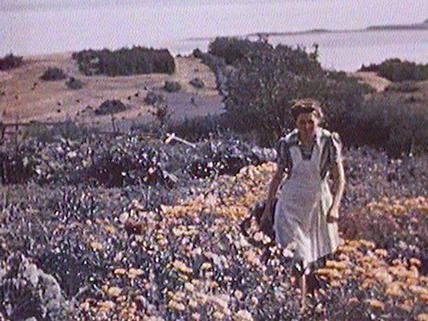 "[Alexis Tremblay, Habitant] was another pastoral celebration -- of the North Shore in Charlevoix county -- an example of the 'picturesque' approach the French Unit film-makers would reject two decades later as the outsider's view." "This film [Alexis Tremblay: Habitant] was constructed around the cyclical patterns of rural life dictated by the seasons, and the omnipresent St Lawrence gave the film an almost classic literary characterization." "Alexis Tremblay: Habitant was a great success and the [National Film Board of Canada] was invited to present a special screening to the Quebec Legislative Assembly. After the screening, [John] Grierson was supposed to present the filmmaker to the audience. Jane Marsh recalled, however, that Grierson became so involved in his own speech that he completely forgot she was there." "Jane Marsh shot Alexis Tremblay: Habitant with Judith Crawley on camera. Originally, Jane Marsh had a disinterested cameraman shooting the film and said that 'every time I wanted to shoot something, he was over there doing other things...' When she replaced him with Judith Crawley, she said that 'the whole thing came into focus... it just sparkles because she's so good.'" "Jane Marsh est la première femme à tourner des images du Québec de façon officielle et la première réalisatrice à avoir une certaine visibilité au Québec puisqu'elle participe a la tournée de présentation de son film Alexis Tremblay Habitant (Terre de nos aïeux, en français) dans la province." National Film Board of Canada. "NFB -- Alexis Tremblay: Habitant." National Film Board of Canada. http://www3.nfb.ca/collection/films/fiche/?id=14041.